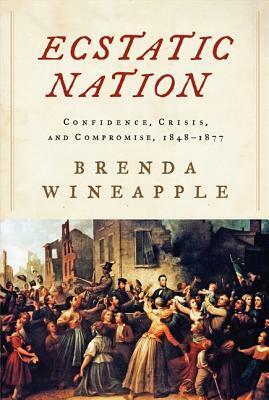 I’m in the midst of reading Brenda Wineapple’s Ecstatic Nation: Confidence, Crisis, and Compromise, 1848-1877. What the book raises for me is whether it is possible for a nation to descend into a fit of collective insanity, or at least ecstasy, in which it takes leave of its senses, with dire consequences to follow. In the first part of the book, she chronicles the increasingly incendiary rhetoric of political leaders and advocates both for slavery and abolition that seemed to stir a growing spirit of fear and anger in the nation that overwhelmed calmer voices like Lincoln, Stephen Douglas, and even Alexander Stephens from the South who recognized the terrible conflict toward which the United States was headed. Certainly, a survey of recent history suggests other examples of national collective insanity. The massacres in Rwanda stand out, where neighbors turned on neighbors in a horrific bloodbath of tribal warfare. People I’ve talked with from China speak with muted tones of the painful experience of Mao’s Cultural Revolution. This makes me wonder whether it is possible that this could occur once again in our country and what form this might take? There is anger and fear and even deep resentments or hatreds in many quarters against ethnic minorities, immigrants, the majority culture, and over those who differ with each other in matters of sexual expression. Efforts to work toward some form of a more perfect union are often trumped (!) by the soundbite smackdown. I don’t think another Civil War is likely, but I think that civil anarchy is possible, a situation akin to the Wild West where power comes from the end of a gun and the rule of law is increasingly impotent to check disorder and violence. Do we realize that the American experiment of the past 239 years can quickly descend into either anarchy or into a reactive tyranny of repression? I believe the way forward is to listen neither to the voices that foment fear and anger, nor to the voices of easy solutionism that promise that America’s greatest days are before us (which is why I’ll never be elected to office). I wonder if we need more voices warning of the abyss toward which we could be heading and calling on us to stop, and lament what has been or is in danger of being lost. I wonder if we need voices calling us back to both our highest national and spiritual values–the recognition that all are created equal and have dignity, and all are gifted contributors to our national greatness. Our words matter as do deeds of justice, mercy and compassion. Those who play with fire often don’t realize they could burn down the house until they do. And that includes our national house. Thanks for this post, and I hope a lot of people read it. Bob, thanks for the alert on this book. Very timely. but they also eliminate one very clear calling by Jesus to love our enemies – turn the other cheek, give more than is asked, etc. – a message of reconciliation that is desperately needed. You may need to revisit this book in future days. I plan to do a full review of the book when I finish it. Christians are not the only to demonize but it is abhorrent that we engage in this. Thanks for your comment John and for hosting such a rich conversation on your page. Feel free to do more in parts. I can conceive of this book as both multidimensional in its content, and applicable to many different issues and events, which later come to mind. It’s sad that this commentary isn’t absurd. Not that long ago I would have thought this was the raving of a conspiracy theorist. Thanks for the reviews; and thanks, by the way, for shorter reviews. If you’re like me, they take longer to write than something shorter, but you pack a lot into a few words. In this busy world, that’s gold! Thanks for your encouragement. I kind of wondered if I was raving yet I don’t think so. Glad you find the reviews helpful!